This review comes to you from the heart of a long time fan of the band STRUNG OUT. Last Sunday evening, September 24th, 2017, the Slowdown in Omaha, NE played host to a small bill of some veteran ska/punk rock bands. Four friends and I were there for one reason though, STRUNG OUT. If you’re not familiar with Strung Out, here’s the breakdown. They formed in 1989 in Southern California making Strung Out one of the longest lasting, ever-progressing bands on the punk dynasty record label, Fat Wreck Chords. 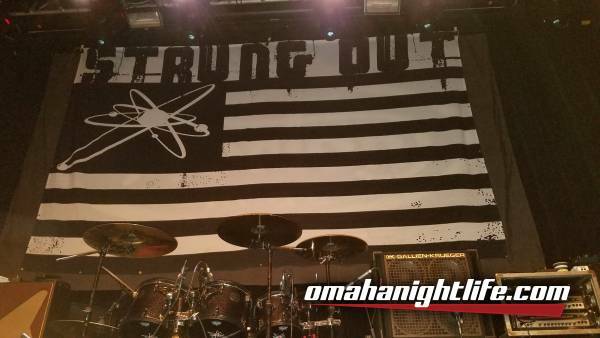 Chaotic & melodic, Strung Out is a genre twisting, methodically produced punk rock band with limitless range. Singer/songwriter, Jason Cruz, practically wrote the soundtrack to my confusing teenage years and did it graciously. With a huge vocal range and backed by an uber-talented group of musicians, Jordan Burns, Jake Kiley, Chris Aiken & Rob Ramos, Jason’s thought provoking, well-sculpted lyrics relay messages of hope & love, as well as, urban decay & civil unrest. As a teenager, every line, of every bar, of every song brought tears of heartache, fists of rage and promise of hope as I blasted down the backroads of my hometown in search of the meaning of life. In true teenage angst fashion, I found solace in music. More so, I believe, than any other kid to wear a pair of headphones and sing out loud, the words that no one else understood. Many moons later, as an (adult), I still feel that literal hair-raising effect from their music. It may take a little longer to find the feeling but it always emerges and, for a brief moment, I am 16 again. I will never lose that. Music has gifted this to me. Omaha, NE has always had a booming music scene and continues to produce great, internationally known acts. 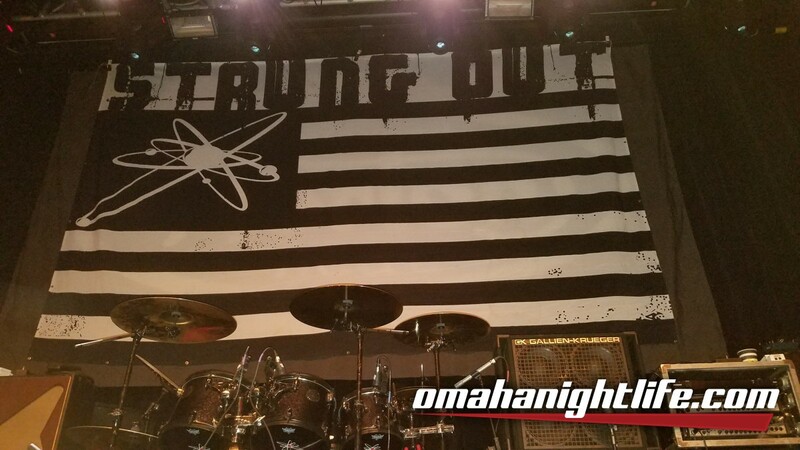 For bands like Strung Out, who have toured for over 25 years solely on the devotion of their fans, Omaha can be a hit or miss stop while on the road. Usually smaller, more intimate shows, consisting of “die hard” Strung Out fans as well as a newer, younger fan base with ears for talent. Their 8 song set at Slowdown was short, yes, but as always, a beast of sensory stimulating melodies and precise song placement that was as good and, undeniably polished, as the first time I saw them in 1996. The crowd was thin but in tune with the band and, in my opinion, this makes for a great personal experience. Strung Out, to me, seems like scientists of their craft. While some other Fat Wreck Chords acts have seemed to reach a plateau, as far as progression goes, the Strung Out I’ve witnessed over the years is forever thriving and shows no signs of slowing. They stand taller, in my eyes, than their peers and continue to push the pigeon-holed envelope of what punk rock is (supposed) to be. Their music is forever in my heart and forever worn, with pride, tattooed on my back.